Wait, so Tony Pashos is actually … good? Watching the Browns each week on offense it seems as if right tackle Tony Pashos is a false start or a holding penalty waiting to happen. But what if we told you the Browns have two of the five best blocking tackles in the entire National Football League? 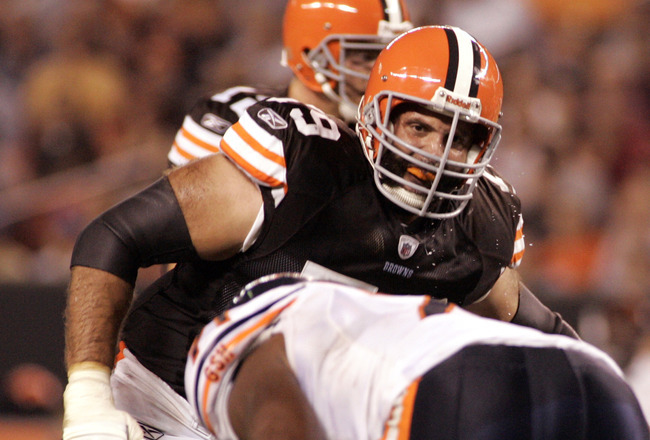 Turns out that, when it comes to pass blocking, Pashos is pretty good, at least according to Pro Football Focus, which looked at how many times a lineman set up in pass protection, figured in how many sacks, hits and hurries they’ve allowed, and came up with a Pass Blocking Efficiency Rating that puts Browns left tackle Joe Thomas at No. 1 in the league (no surprise) and Pashos at No. 4 (huge surprise). When a team picks a tackle in the first round they’re thinking that guy is going to keep his quarterback clean. We’ve mentioned countless times the impact pressure can have on a passer, so just imagine how much worse Colt McCoy could be if he didn’t have the most efficient tackle in the league blocking for him. I am, of course, referring to Joe Thomas, who in allowing just three sacks, a hit and 15 hurries on 527 pass blocking snaps, is flying high with a 97.2 PBE rating. He narrowly beats out Andrew Whitworth of the Bengals and David Stewart of the Titans (97.1 ratings), though it should be noted he has given up eight penalties. Interestingly, Thomas isn’t the only Brown to do well in the tackle rankings. Tony Pashos has struggled to impose himself in the run game, but with just 17 total pressures given up on 398 pass blocking snaps, he ranks fourth out of all right tackles. With the rest of the Top 10, you kind of understand them being there, and it’s only really Pashos whose name sticks out. He finds him behind the aforementioned Stewart, Tyson Clabo and rookie sensation, Tyron Smith. Looks like general manager Tom Heckert knows what he’s doing after all. Uni Watch had a couple of Cleveland-related items today. First, the Lake Erie Monsters will wear Cleveland Crusader jerseys for their game Friday night. We actually remember going to a couple of Crusader games at the Coliseum when we were young, and always liked those uniforms. Then there’s the story of how one of Jim Brown’s practice helmets ended up in the hands of an 11-year-old on his birthday in 1971. Finally, Landon Donovan is returning to England to get some much-needed playing time against the top competition in the Premier League. Donovan will return to Everton for eight weeks, most likely making his debut on Jan. 4 against Bolton and ending with the Merseyside derby with Liverpool in late February. “The opportunity to return to Everton and play for such a well-respected club and a manager that I hold in such high regard was something that was simply too good to pass up,” Donovan said on the club’s website.